We were both blown away by just how wonderfully tasty this grilled marinated medley was. The perfect dish for a nice (but kinda warm) spring day here in Indiana, it couldn’t have been any easier. We just grilled a few vegetables and a little smoked sausage, tossed them all into a pan along with some broth and balsamic vinegar, and in no time we had a complete dinner. And yes, like us you’ll want to drink the juices out of the bottom of the pan. They’re divine. There aren’t any rules to making a grilled marinated medley. Use whatever meat and vegetables you desire or can find fresh. I went with a no-thrills smoked sausage ring, sliced into rings, and then just grilled a few of our favorite vegetables. Zucchini would also be great in it, along with squash (I love grilled squash and grilled Tuscan vegetables). Fire up your grill for direct and indirect cooking. Grill the sausage then cut into rounds. Toss the potatoes with just a splash of oil and grill (I use a grill basket) until just starting to get soft. Remove. Also place the corn onto the grill. Rotating often, cook until starting to char. In a large deep disposable aluminum pan combine all ingredients. Place back onto the grill over indirect heat and let cook another 30 minutes-1 hour or until the potatoes are completely done and the onions are softened. You don't want the broth to boil, but a light simmer is ok. Serve hot with plenty of the broth from the bottom of the pan. 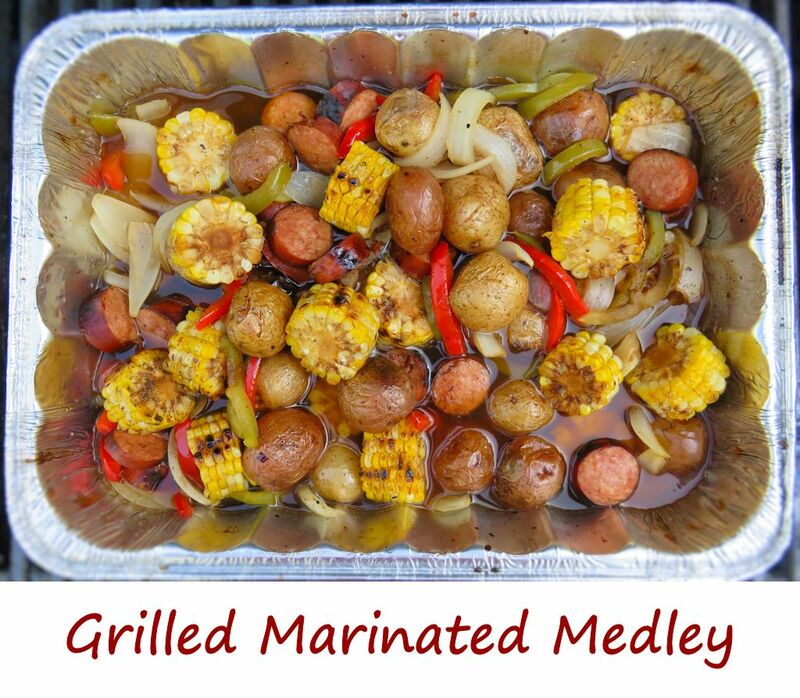 This entry was posted in From the Grill & Smoker and tagged grilled, Grilled Marinated Medley, medley, recipe, smoked sausage, vegetables by Mike. Bookmark the permalink.